CARBOHYDRATE AND FAT METABOLISM. Complete combustion of carbohydrate and fat in the liver and muscle produces CO2, which forms carbonic acid. 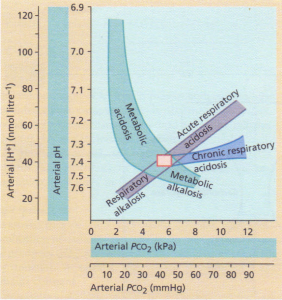 If respiratory function is normal, the partial pressure of CO2 remains constant. Incomplete combustion of these metabolic fuels results in the formation of organic acids such as lactic acid, hydroxybutyric acid, acetoacetic acid and free fatty acids. These may cause significant acidosis if their production exceeds the capacity of the liver to metabolize them completely, as in lactic acidosis and diabetic ketoacidosis. resulting in no net acid or base production (assuming CO2 is removed by respiration). Alternatively, if NH4+ is excreted in the urine, this leaves HC03- within the body, resulting in alkali retention, which is equivalent to H+ excretion. Both the liver and the kidney appear to have important regulatory roles in acid-base balance. The liver regulates the degree to which NH4+ and HC03- are metabolized to urea in response to acid-base balance; ureagenesis is increased by alkalosis (thus consuming bicarbonate) and decreased by acidosis (thus sparing bicarbonate). NH.+ not utilized for ureagenesis is incorporated into glutamine, which is transported to the kidney: hydrolysis of glutamine in the kidney also appears to be regulated by acid-base balance and is an important mechanism by which NH4+ is excreted in the urine. 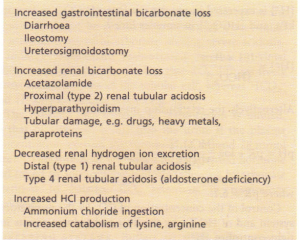 NH4+ excretion in urine increases in response to acidosis, and defective NH4+ excretion in tubular diseases (distal renal tubular acidosis) causes systemic acidosis. • Increased sodium delivery (for instance caused by diuretics) and hyperaldosteronism cause increased excretion of H+ and K+, leading to hypokalaemia and alkalosis. • Decreased sodium delivery (e.g. hypovolaemia) or aldosterone deficiency cause hyperkalaemia and acidosis. By the same mechanism, increased K+ delivery leads to acidosis and alkaline urine. In this respect, the requirement for control of acid-base balance is overridden by the requirement to maintain extracellular volume. RENAL HC03- HANDLING. Bicarbonate filtered at the glomerulus must be reabsorbed, otherwise there would be massive losses of bicarbonate causing severe acidosis. 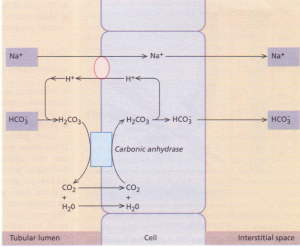 Sodium bicarbonate reabsorption in the proximal tubule is complicated by the fact that CO2 diffuses freely across the membrane of the tubular cell, whereas HC03- and H+ cannot diffuse freely. The capacity for bicarbonate reabsorption is limited, so that bicarbonate is lost into the urine if the plasma concentration exceeds the threshold of around 28 mmol litre-I. This threshold is lowered by parathyroid hormone and raised by intracellular acidosis (allowing bicarbonate retention to balance CO2 retention in respiratory acidosis). BUFFERING SYSTEMS. Buffers are weak acids, present in blood and urine, which prevent large fluctuations of hydrogen ion concentration. Relationship between [WI and pH . Control of the concentration of CO2 by the respiratory system and of HC03- by the liver and kidneys results in tight control of [H+]. Some textbooks refer to NH3 and NH. + as a buffer system. 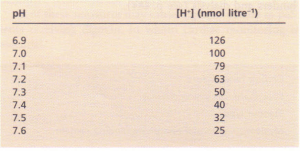 This is not strictly accurate, although, as discussed above, NH.+ excretion in the urine results in HC03- retention. • Abnormalities in the regulation of bicarbonate and other buffers in the blood (,metabolic’ acidosis and alkalosis) . Both may, and usually do, coexist. For instance, metabolic acidosis causes hyperventilation (via medullary chemoreceptors, leading to increased removal of CO2 in the lungs and partial compensation for the acidosis. Conversely, respiratory acidosis is accompanied by renal bicarbonate retention, which could be mistaken for primary metabolic alkalosis. The situation is even more complex if a patient has both respiratory disease and a metabolic disturbance. the patient has respiratory dysfunction, leading to failure of CO2 elimination, but this is partly compensated for by metabolic acidosis, stimulating respiration and CO2 removal (this is the commonest ‘combined’ abnormality in practice). This is caused by retention of CO2, The PaC02 and [H+] rise. Renal retention of bicarbonate may partly compensate, returning the [H+] towards normal. Increased removal of CO2 is caused by hyperventilation so there is a fall in Paco2 and [H+]. This is due to the accumulation of any acid other than carbonic acid (see above). The most common cause islactic acid production during shock or following cardiac arrest. • The normal anions present in plasma are Cl-, HC03-, negative charges present on albumin, phosphate, sulphate, lactate, and other organic acids. • The sum of the positive and negative charges are equal. • Measurement of Na”, K+, Cl- and HC03- are usually easily available. • Beware: some textbooks leave [K+] out of the calculation, giving a lower ‘normal range’ . If the anion gap is normal in the presence of acidosis, one may conclude that H+Cl- is being retained or Na+HC03- is being lost. Causes of a normal anion gap acidosis are given. If the anion gap is increased, one may conclude that an unmeasured anion is present in increased quantities. This may either be one of the acids normally present in small, but unmeasured quantities, such as lactate, or an exogenous acid. Causes of a high anion gap acidosis are given. The anion gap involves a number of assumptions and uncertainties, such as the negative charge attributable to albumin. An albumin concentration of 40 g litre-I gives a negative charge of around 10 mmol; a fall in albumin concentration to 20 g litre-I would lower the normal anion gap by 5 mmollitre-‘. Both types of acidosis may co-exist. For instance, cholera would be expected to cause a normal anion gap acidosis due to massive gastrointestinal losses of bicarbonate, but the anion gap is often increased due to renal failure and lactic acidosis as a result of hypovolaemia. Increased lactic acid production occurs when cellular respiration is abnormal, either due to lack of oxygen in the tissues (‘type A’) or to a metabolic abnormality, e.g. druginduced Ctype-B’) . The commonest cause septicaemic or cardi genic shock. Significant acidosis can occur despite a normal blood pressure and Pa02′ due to splanchnic and peripheral vasoconstriction. Acidosis worsens cardiac function and vasoconstriction further, contributing to a downward spiral and fulminant production of lactic acid. 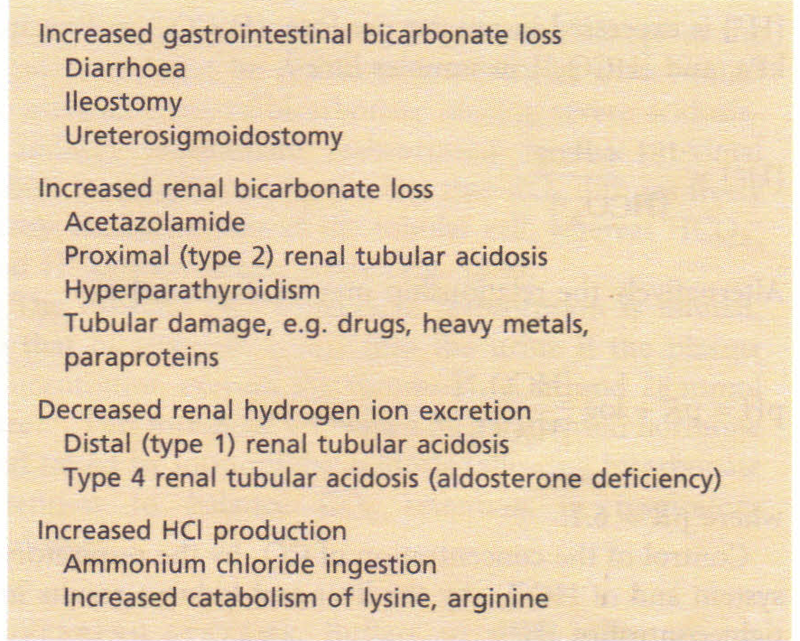 Causes of metabolic acidosis with an increased anion gap. This is a high anion gap acidosis due to the accumulation of organic acids, acetoacetic acid and hydroxybutyric acid due to increased production and some reduced peripheral utilization. This term refers to systemic acidosis caused by impairment of the ability of the renal tubules to maintain acidbase balance. This group of disorders is uncommon and only rarely a cause of significant clinical disease. Renal tubular acidosis may be secondary to immunological, drug-induced or structural damage to the tubular cells, an inherited abnormality, or an isolated (‘primary’) abnormality. As with most disorders which are not well understood, the nomenclature is confusing. 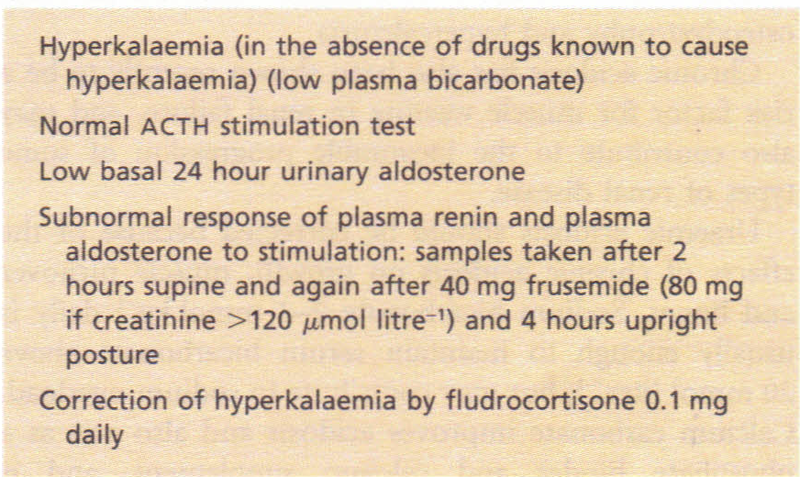 TYPE 4 RENAL TUBULAR ACIDOSIS, also called hyporeninaemic hypo aldosteronism, is probably the commonest of these disorders. The cardinal features are hyperkalaemia and acidosis occurring in a patient with mild chronic renal insufficiency, usually caused by tubulointerstitial disease (e.g. reflux nephropathy) or diabetes. 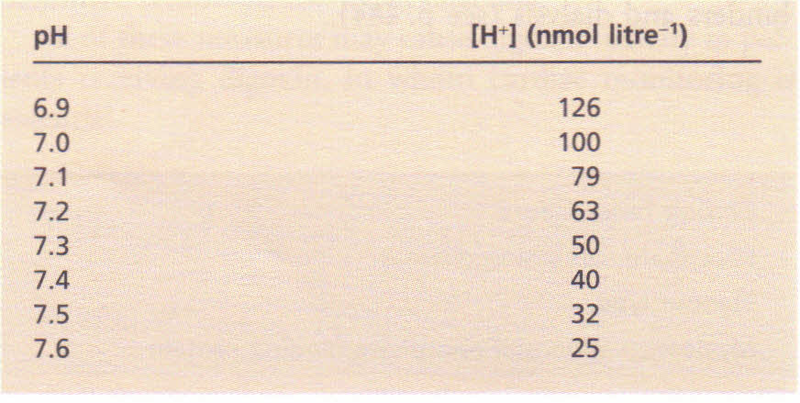 Plasma renin and aldosterone are found to be low even after measures which would normally stimulate their secretion (Table 10.21). An identical syndrome may be caused by NSAIDs, which impair renin and aldosterone secretion. In the presence of acidosis, urine pH may be low. Treatment is with fludrocortisone, sodium bicarbonate, diuretics, or ion exchange resins to remove potassium, or some combination of these. 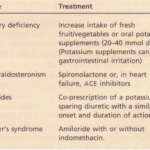 Dietary potassium restriction alone is ineffective. TYPE 3 RENAL TUBULAR ACIDOSIS is vanishingly rare, and represents a combination of type 1 and type 2. TYPE 2 (‘PROXIMAL’) RENAL TUBULAR ACIDOSIS is very rare in adult practice. It is caused by failure of sodium bicarbonate reabsorption in the proximal tubule. The cardinal features are acidosis, hypokalaemia, an inability to lower the urine pH below 5.5 despite systemic acidosis, and the appearance of bicarbonate in the urine despite a subnormal plasma bicarbonate. This disorder normally occurs as part of a generalized tubular defect, together with other features such as glycosuria and amino aciduria. Treatment is with sodium bicarbonate: massive doses may be required to overcome the renal ‘leak’. These abnormalities result in osteomalacia, renal stone formation and recurrent urinary infections. Osteomalacia is caused by buffering of H+ by Ca2+ in bone resulting in depletion of calcium from bone. Renal stone formation is caused by hypercalciuria, hypocitraturia (citrate inhibits calcium phosphate precipitation), and alkaline urine (which favours precipitation of calcium phosphate). (type 4 renal tubular acidosis). 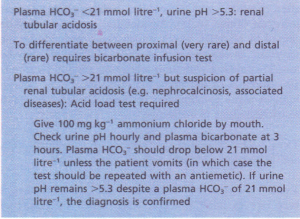 Diagnosis of renal tubular acidosis. Recurrent urinary infections are caused by renal stones. This disorder is associated with numerous diseases including any cause of nephrocalcinosis (causing structural tubular damage), immunological damage (for instance, in association with Sjogren’s syndrome), and a number of drugs. Treatment is with sodium bicarbonate, potassium supplements and citrate. Thiazide diuretics are useful by causing volume contraction and increased proximal sodium bicarbonate reabsorption. Kidney disease may cause acidosis in several ways. Reduction in the number of functioning nephrons decreases the capacity to excrete NH! and H+ in the urine. In addition, tubular disease may cause bicarbonate wasting. Acidosis is a particular feature of those types of chronic renal failure in which the tubules are particularly affected, such as reflux nephropathy and chronic obstructive uropathy. Chronic acidosis is most often caused by chronic renal failure, where there is a failure to excrete fixed acid. Up to 40 mmol of hydrogen ions may accumulate daily. These are buffered by bone, in exchange for calcium. Chronic acidosis is therefore a major risk factor for renal osteodystrophy and hypercalciuria. Chronic acidosis has also been shown recently to be a risk factor for muscle wasting in renal failure, and may also contribute to the inexorable progression of some types of renal disease. Uraemic acidosis should be corrected because of the effects of chronic acidosis on growth, muscle turnover end bones, Sodium bicarbonate 2-3 mmol kg:’ daily is usually enough to maintain serum bicarbonate above 20 mmollitre-I, but may contribute to sodium overload. Calcium carbonate improves acidosis and also acts as a phosphate binder and calcium supplement, and is increasingly used. Acidosis in end-stage renal failure is usually fully corrected by adequate dialysis. Clinically the most obvious effect is stimulation of respiration, leading to the clinical sign of ‘air hunger’, or Kussmaul’s sign. Interestingly, patients with profound hyperventilation may not complain of breathlessness, although in others it may be a presenting complaint. Acidosis increases delivery of oxygen to the tissues by shifting the oxyhaemoglobin dissociation curve to the right, but also leads to inhibition of 2,3- DPG production, which returns the curve towards normal. Cardiovascular dysfunction is common in acidotic patients, although it is often difficult to dissociate the numerou possible causes of this. There is no doubt that acidosis is negatively inotropic. Severe acidosis causes venoconstriction, resulting in redistribution of blood from the peripheries to the central circulation, and increased systemic venous pressure, which may worsen pulmonary oedema caused by myocardial depression . Arteriolar vasodilatation also occurs, further contributing to hypotension. Cerebral dysfunction is variable. Severe acidosis is often associated with confusion and fits, but numerous other possible causes are usually present. As mentioned earlier, acidosis stimulates potassium loss from cells, which may lead to potassium deficiency if renal function is normal or to hyperkalaemia if renal potassium excretion is impaired. In lactic acidosis caused by poor tissue perfusion (‘type A’), treatment should be aimed at maximizing oxygen delivery to the tissues and usually requires inotropic agents, mechanical ventilation and invasive monitoring. In ‘type B’ lactic acidosis treatment is that of the underlyingdisorder, e.g. • Rapid correction of acidosis may result in tetany and fits due to a rapid decrease in ionized calcium. • Administration of sodium bicarbonate may lead to extracellular volume expansion, exacerbating pulmonary oedema. • Bicarbonate therapy increases CO2 production and will therefore only correct acidosis if ventilation can be increased to remove the added CO2 load. • The increased amounts of CO2 generated may diffuse more readily into cells than bicarbonate, worsening intracellular acidosis. Administration of sodium bicarbonate (50 mmol, as 50 ml of 8.4% sodium bicarbonate intravenously) is sometimes given during cardiac arrest and is often necesnecessary before arrhythmias can be corrected. Correction of hyperkalaemia associated with acidosis is also of undoubted benefit. In other situations there is no clinical evidence to show that correction of acidosis improves outcome, but it remains standard practice to administer sodium bicarbonate when [H”] is> 126 nmol litre ” (pH <6.9) using intravenous 1.26% (150 rnrnol litre'”) bicarbonate. 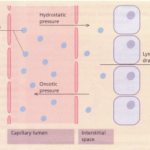 All of these may be thought of as increasing secretion of H+ in exchange for Na” in the distal tubule. Vomiting causes alkalosis both by causing volume depletion and by causing loss of gastric acid. Exogenous alkalis, such as those found in effervescent preparations of analgesics or in proprietary antacids, may also contribute to metabolic alkalosis, particularly if combined with another contributory factor. Cerebral dysfunction is an early feature of alkalosis. The oxyhaemoglobin dissociation curve is shifted to the left. Respiration may be depressed. Replacement of sodium, potassium and chloride allows renal excretion of bicarbonate. Clearly sodium chloride administration should be avoided in patients on diuretics as appropriate treatment for heart failure. Acetazolamide may be useful in patients without sodium depletion. 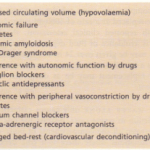 Arieff AI (1993) Management of hyponatraemia. British Medical Journal 307, 305-308. Atkinson DE & Bourke E (1987) Metabolic aspects of the regulation of systemic pH. American Journal of Physiology 252, F947-F956. Cameron et al. 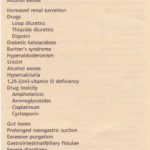 (eds) (1993) Water, electrolyte or acidbase disorders. In: Oxford Textbook of Clinical Nephrology, pp. 867-917. Oxford: Oxford University Press. Editorial (1988) What causes oedema? Lancet i, 1028- 1030. 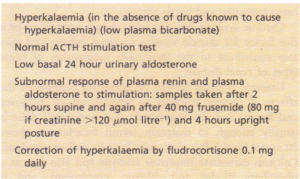 Field MJ & Giebisch GJ (1985) Hormonal control of renal potassium excretion. Kidney International 27, 379- 387.